Treasuring relationships with customers is an indispensable part of expanding the business into successful one. In this era of competition and innovation, it’s truly important to be devoted and thoughtful for them. In this digital age, customers are bestowed with the power of social media. Any unsatisfied customer can share his/her opinion on social media in a blink of an eye which can affect your business adversely. Therefore, it is absolutely important to acquaint your customers with an outstanding experience. Building trust and love between your company and your customers can help you get positive word of mouth which is absolutely priceless. Even promotion through campaigns can’t get you that! Creating a customer-centric company will never make you run out of clients. In fact, with the spread of word, clients will bring more customers for you! Accustom your clients with the facts, documentation, and news to showcase your capabilities. This, in turn, will make them realize your credibility and the benefits of trading with your company. Demonstrate the working procedure to the clients and with this how they can maximize their profit ratio. Share important and interesting articles with clients in order to make them learn something new always. Becoming an expert is a dynamic process and in order to be a reliable and knowledge-bank for your clients, you need to keep yourself updated with the latest research and trend in your industry. Clients and customers trust you for your uniqueness and the exceptional services that you offer to them, unlike others. They expect you to meet the deadlines as decided in earlier stages. If you have committed to something, then what may come; you must keep your word. Fulfilling your promises will only help you in boosting the transparency level in your business and simultaneously, a feeling of trust and dependability is infused in your clients. Trust is a very sensitive factor in any relation, be it professional or personal. And so it’s apparent that it is applicable for client and company relations as well. Thus, while handling projects or providing services to clients, it is crucial to introduce them with any bad news or mishap, if takes place. At first, it will upset them and they might fire you with questions, such as why and what. But soon that why and what will convert into how it can be sorted! This implies that rather than hiding things initially to escape, it’s preferable to admit mistake sophisticatedly. 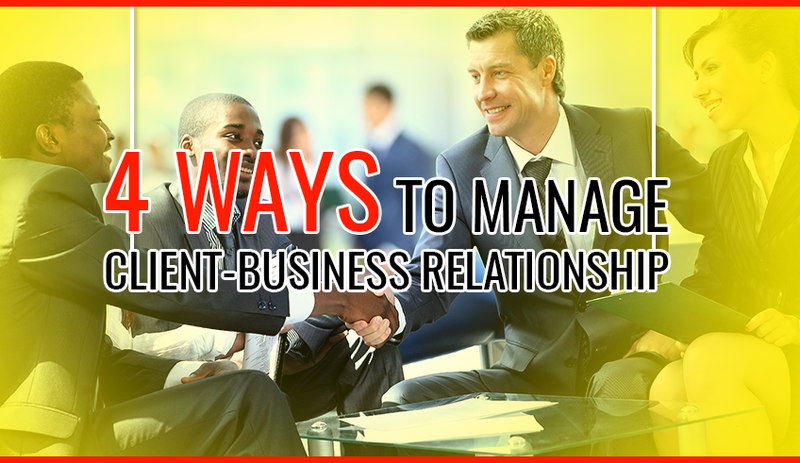 It is going to make your relationship stronger than ever with your clients in the long run. Once the company has offered its services to the clients, the next step comes in which it has to invite customers for acquiring their feedback on the products and services provided to them. Another thing to keep in mind is to act as a good listener and thank them for their contribution. You can take clients’ feedback through surveys since surveys prove really useful and valuable to find about the likings and disliking of your business from clients. Keep that survey data safely with you in order to analyze the evolvement in business. This, in turn, will help you to formulate strategies for business purpose in future. Also, you can take feedback from clients through third party specialist as it is more likely that they will tell them the truth. Thus, to retain your clients, you must apply these tactics and put efforts to elevate your business growth. Customers are the king of the market. Treat them like that! Author Bio: Macy Jones is an app developer in App Development Company in Sydney, Australia. Apart from this She loves writing and reading blogs related to App designing and development. How To Look For The Best Type Of Dairy Ingredients?